Do we define together some rules for cooperation? Can we make them explicite? Can we make expectations of everybody explicit? What kind of decision-making do we plan? Do we know what the roles are? Can we be creative in roles? Do we have rotating roles? 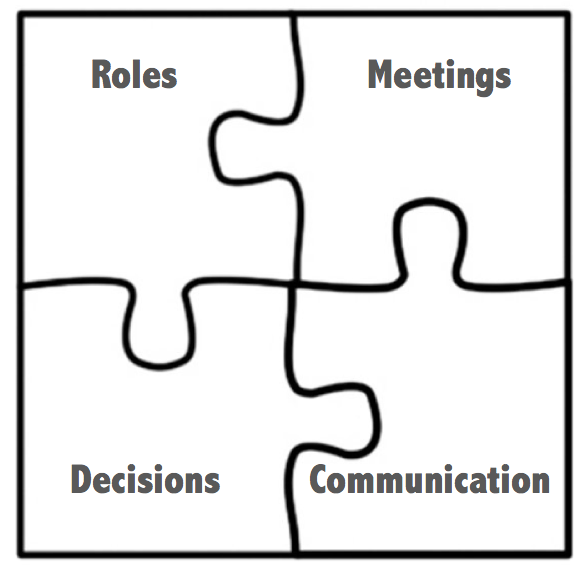 Have we agreed on a formal communication methodology (objectives, information, sharing data, …)? How much time do you spend on meetings? Do you consider it as an acceptable level? Are you happy with the meetings you attend? Are they efficient? Do you get energy out of them? 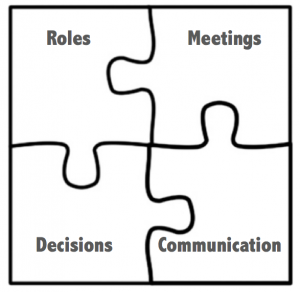 Do you think being more creative in meetings, roles, decision making could make a difference? Have you ever discussed decision making in group? What could you imagine other ways for the governance of collaborations you’re involved in? A very interesting practice for self-managed teams could be to use the “advice process”, more about it here. Any person can make any decision after seeking advice from 1) everyone who will be meaningfully affected, and 2) people with expertise in the matter. Advice received must be taken into consideration.